Wait! Wait! Nothing bad, but it’s true. See, two months ago, I came to you with an outlandish declaration. I had a drink to top our favorite coffee shop holiday drink. Remember the one? Yep, the PSL (AKA: Pumpkin Spice Latte). The homemade version was a life-changer. Coffee-changer. Wallet-changer. (Literally, more change in your wallet.) Everything-changer. 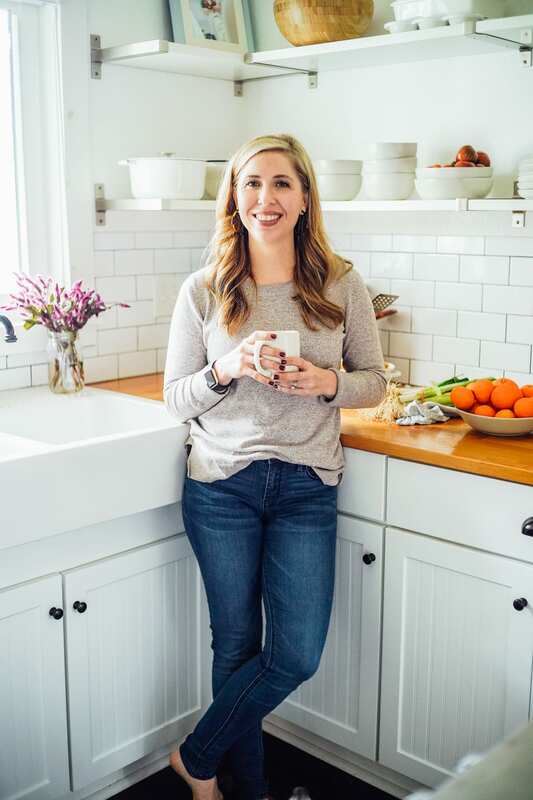 I’m pretty sure Live Simply gained a following just for that drink…people were obsessed!! The very best part was that it was a drink that was 100% okay to be obsessed with. My homemade Pumpkin Spice Latte is made from real ingredients (including real pumpkin, imagine that!) and is actually healthy. Side Note: Coffee is completely healthy. Don’t believe me? You should see me without a cup! My PSL affair lasted for two whole months, until I just couldn’t look at one more tablespoon of orange puree. Maybe it was the overdose of pumpkin everything on Pinterest or the fact that I took every chance to make my favorite pumpkin drink. Whatever it was, I moved on. I’m sorry, pumpkin. I promise I’ll want you again next year. We just need a good ten month break from each other. So, that’s the story. It’s clean and wholesome, in the very best form of moving on in a relationship. Over the last couple of weeks, with the polar vortex outside my Florida door, I’ve been snuggled in my warmest Florida sweater and socks. Snuggling calls for a new favorite warm drink. A drink that’s simple and classic, yet sophisticated: homemade hot chocolate. I’m all for making homemade hot chocolate on the stove-top, but life during this cold holiday season is busy, which means I don’t always have time to find multiple ingredients in my cupboard for just one cup of chocolatey satisfaction. To accommodate the busyness of the season and my deep need for a warm chocolate drink, I make a large batch of homemade hot chocolate mix. My homemade hot chocolate mix is made without white, refined sugar and milk powder (something deeply disturbs me about “milk powder”). The simple, healthier-than-store-bought ingredients come together in just seconds, making enough hot chocolate mix to enjoy over and over again on busy, cold days. 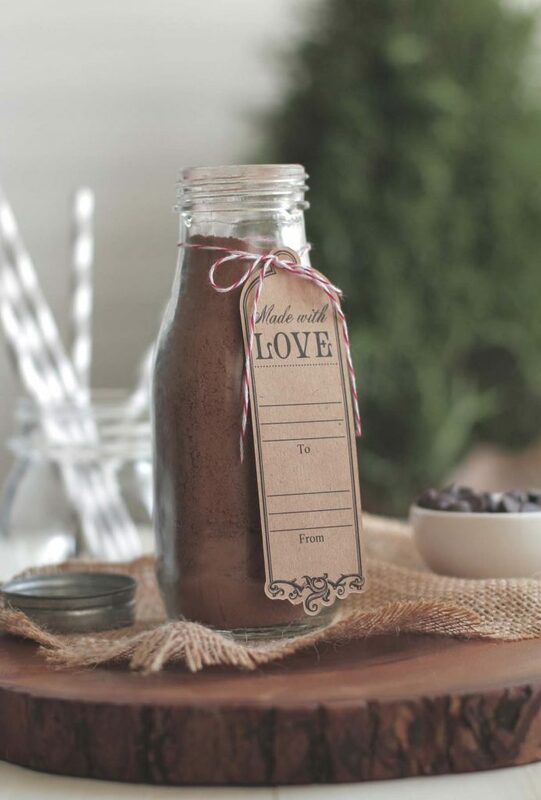 Homemade hot chocolate mix also makes the perfect gift. 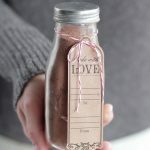 Yes, it seems like a very simple gift, but friends and family go crazy (really, I’m not over exaggerating) for a homemade bottle of hot chocolate. 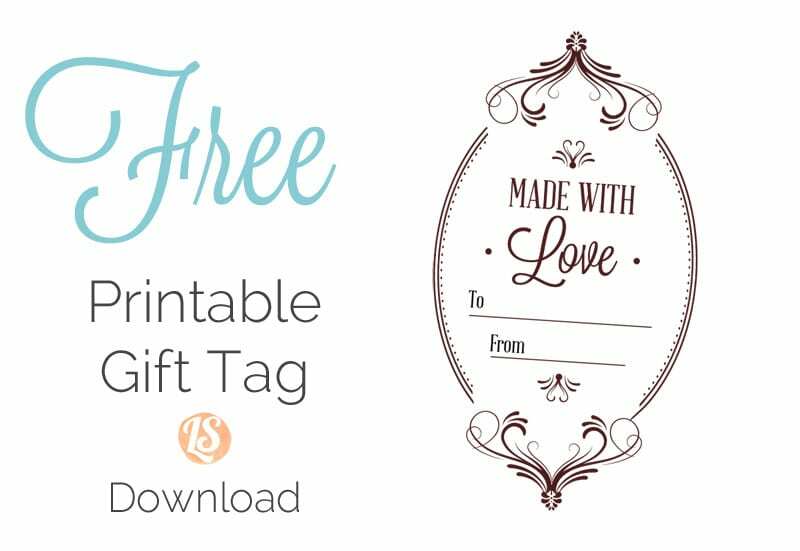 I like to use milk bottles which can be found at Michael’s Craft Stores, Target, or Amazon, and then tie a homemade gift tag (printable found here) for the perfect homemade gift. In a food processor, pulse the sucanat for 40 seconds until fine. Add the chocolate chips, cocoa powder, and the vanilla beans (the inside of the vanilla bean). Pulse for 30-45 seconds until the chocolate chips have been ground into a fine powder. To Use: Warm 1 cup of milk. Add 3 tablespoons of hot chocolate mix to the warm milk and stir. Tip: Don’t throw out the long vanilla bean (the exterior). Add the long vanilla bean pod to the jar of the hot chocolate. The bean pod can also be added to a jar of vodka for making homemade vanilla extract. What a great recipe! And I love how you chose to package it. 😉 Perfect gift idea! Great, thank you for sharing. Shopping around for the best price is great :). I either buy sucanat from my health food store or Amazon (subscribe and save). Hey Ellens, We don’t count calories, so I’m not sure :). This is a fab Idea. Any ideas on subbing the Sucanat if it isn’t available? Hey Maryam, Thank you. You could use raw sugar, white organic sugar, or coconut palm sugar. Awesome, Maryam! I think coconut palm sugar and sucanat are pretty similar in flavor and sweetness. Let me know how it goes! Thanks, Sarah. The chocolate chips add an amazing creamy sweetness…highly recommend them :). Sarah, I added the smidgen of salt tonight and it was delicious! Thanks for the suggestion :). Ver excited! I’m making this tomorrow for gifts. I’ll need about 24. Do you know how many milk bottles one recipe will fill? I was very fortunate to find the bottles at Target, though I had to go to two! Hey Brenda, I’m so glad you found the milk bottles at Target! This recipe will fill about 1.5 milk bottles (I’m guessing you’ll be using the same ones as in the picture…they are from Target too). You can double the recipe and possibly triple, depending on the size of your food processor, so you can get multiple jars at a time. Where did you get those precious bottles?!? I had a vintage garden party and was looking everywhere for some like that! I would love to know where you bought them!!! Love this recipe and will soon try it! Thank you, Madelyn. I love the bottles too. I found them at Target in the dollar section about a month ago. I’m really looking forward to try this! Just one question: do you mix it in hot water or hot milk? Here in Norway there is two different ways to make hot chocolate/cocoa, but I guess you’re using milk? Hey Camilla, This powder is mixed with hot milk. Enjoy!! Is it possible to make this without a food processor? I’d really love to package this up for Valentine’s day! Hey Anielyn, I think you could make this recipe in a blender too. Could I use vanilla bean powder instead of buying the pods?? This recipe looks delish! Hey Elle, I haven’t tried the powder before, but I think it should work well. These look lovely! I’ve been seriously considering homemaking a lot of Christmas presents this year, and this idea looks perfect. I’d like to write an approximate “use by” date on the tag – how long would you say the mix would be good for? Thank you. Hey Jess, That’s an awesome idea!! The mix will last the life of the chocolate chips and cocoa powder, so about a year (or longer). I have a Ninja….would that work to mix?? Hey Amy, Yes, I believe so :). Great idea, especially now so close to Christmas! I guess I can use stevia for my calories counting husband, anyone tried it? However my question is: how long roughly this hot chocolate powder mix can be stored? If all ingredients are dry I guess it could be a couple of months but what about vanilla? The hot chocolate mix can be stored for many months (at least) since all of the ingredients are shelf-table for quite a long time. The vanilla is also shelf-stable. You should list all your ingredients under ingredients. Seems you left out the milk (whole?) and the hot chocolate mix. Hey Douglas, All of the ingredients are listed for the hot chocolate mix recipe. Do you need help with a particular ingredient? Thank you so much for this recipe! I was looking for a mix without milk powder. I made it with regular sugar and regular chocolate chips though, because ingredients like that are very hard to come by over here. Delicious. Can I use Splenda for Sucanat(whatever that is)? Hey Nikki, I don’t recommend using splenda for any recipe. You could use organic cane sugar. Hey Nikki, It’s a more natural form of sugar (a sugar that’s minimally processed). Coconut sugar is another popular minimally-processed sugar you can find in most grocery stores. Coconut sugar, organic cane sugar, or sucanat work well in this recipe. I recommend avoiding artificial sweeteners: http://articles.mercola.com/sites/articles/archive/2000/12/03/sucralose-dangers.aspx. If I were to substitute vanilla bean powder for the vanilla bean, about how much of the vanilla bean powder would you recommend using per batch? Hey Rebecca, I’m not 100% sure about this answer, but I believe 1 teaspoon of vanilla bean powder is equal to 1 vanilla bean. So I would use 1-2 teaspoons of vanilla bean powder. Love this idea. I do a Christmas basket for neighbors and friends and this would be a nice addition. Thanks for the inspiration . . . love that it has heathy ingredients, too, of course! Approximately how many cups of the hot chocolate mix does one recipe make? Hey Kat, About 2 cups of hot chocolate mix. I will be making these for Christmas gifts this weekend. And many other of your recipes too. Thank you so much! You mention that the gift tags are available in your holiday ebook. Is the ebook still available? It doesn’t appear to be on the linked page. Can you make this without the vanilla? Hey Rhonda, Yes, you can :). What do you think about adding cinnamon or cayenne pepper for a little spice? Definitely, Sarah! Both would be amazing. I was looking for a recipe for family movie night…this was perfect. I used cacao and organic raw sugar plus powdered vanilla, it was delicious! Yay, Lois! So glad you all enjoyed it.